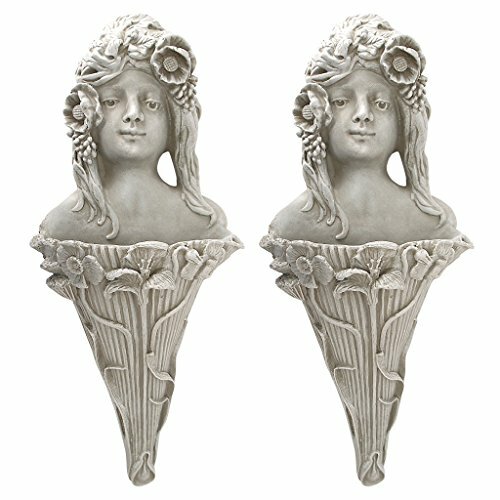 Add sculptural, Art Nouveau beauty and instant, turn-of-the-century architectural flair to your home or garden walls! Poppies and irises embellish an amazing wall pocket planter that's every bit as beautiful alone as with your added flowers. With a nod to the ornately embellished works of artist Alphonse Mucha, the Poppy Princess herself holds court atop the almost two-foot tall, designer resin sculpt of quality designer resin with an antique stone finish. A pair of these Design Toscano exclusives is exquisite flanking a doorway, fireplace or garden gate. Each: 9"Wx6"Dx23"H. 6 lbs.